Well, Kaia's first year of school has officially ended & I really do not know where the time went!?! Yes, it was only a one day a week class, that lasted about 2 & a half hrs. But none the less, it was school for us. I find myself getting emotional over the whole thing! Great, I'm gonna be a wreck by the time she graduates from High School! She had great teachers & made so many little friends! (Autry, Brian, Sonia, Alexander, Rose, Jack, Chloe, Soren, Luna, Erik, Livia & Ben to name just a few) And just as importantly I made some really good friends that made life with my first biological baby easier. The people who you really want to talk to about everything you are going through in the first year of your child's life, is another mother who is going through the exact same thing!! There is something so comforting about suffering the sleepless nights together... I guess that's the whole misery loves company thing? I learned a lot from these women over the past year & I am very grateful. One of the mommies put a end of the year gift together for our teachers. We each had to make a page with photos & things as a special token for them to remember our children by. It turned out so lovely, I wish I could have a copy of the book! LOL! So here is the page I made for Kaia. 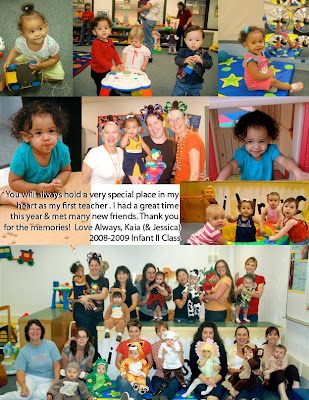 Something extra special is I will always remember her 1st day of class was on her 1st Birthday, August 28, 2008. Sigh..they were so little in the beginning! I didn't think about it being Ben's first year of "school," but I suppose you're right. Oh man, it's all downhill from here!